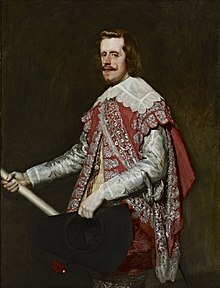 Philip IV (Spanish: Felipe IV, Portuguese: Filipe III; 8 April 1605 – 17 September 1665) was King of Spain between 1621 and 1665 He was also sovereign of the Spanish Netherlands and King of Portugal until 1640. His daughter was Marie Thérèse of Austria, wife of Louis XIV. All but three of his children died in childhood. Archduchess Marie Thérèse (1638–1683), married Louis XIV of France and had children.